Image Processing with Primitive: For every uploaded images to Maid-chan, Maid-chan will convert it to a geometric primitive GIF via Primitive. 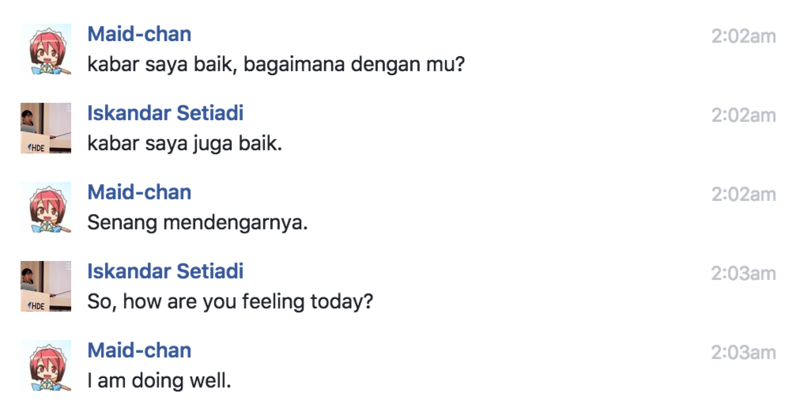 Chatbot with ChatterBot: For every text messages outside the provided available commands, Maid-chan will send a text response via ChatterBot and langdetect (to detect the language validity). 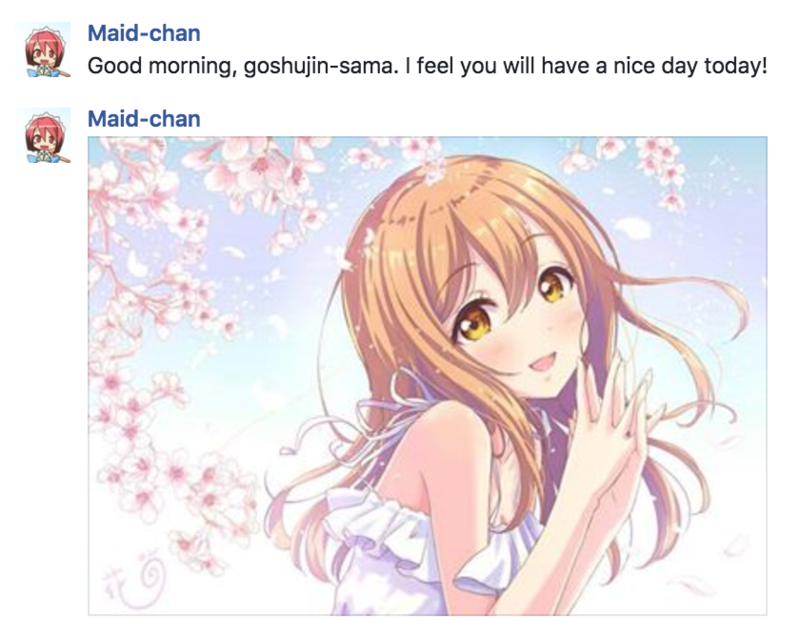 Daily Offerings: If user decides to subscribe for offerings feature, Maid-chan will send a good morning and a good night message with one additional image from offerings/stock directory. Daily Japanese Lesson: If user decides to subscribe for Japanese lesson feature, Maid-chan will send a Kanji (N1-N4, by choice) and a Vocabulary for each day. RSS Feed Notifier: The idea is similar to rss-twilio-bot, where all subscribed RSS feeds are aggregated to Facebook Messenger via Maid-chan scheduler. 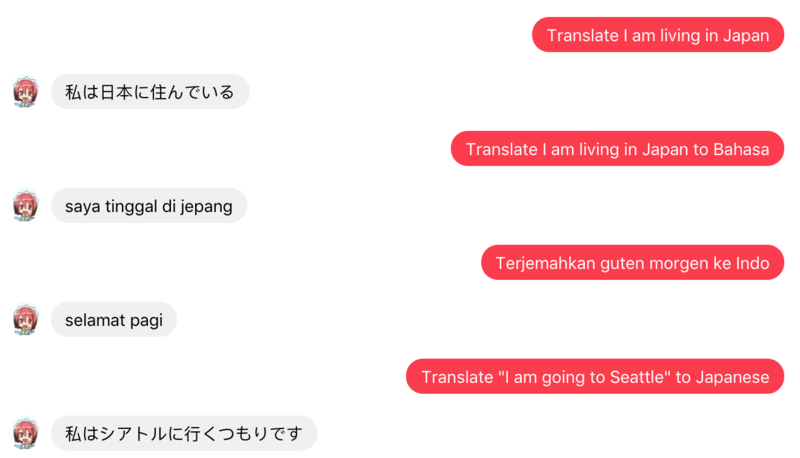 Translate text via Google Translate: For every messages which have “translate” and its language derivatives in it, Maid-chan will use Google-translate to translate the given messages (with several default configuration). Tokyo Train Status feat Yahoo Japan: Yahoo Japan provides real-time information of all trains status in Tokyo. 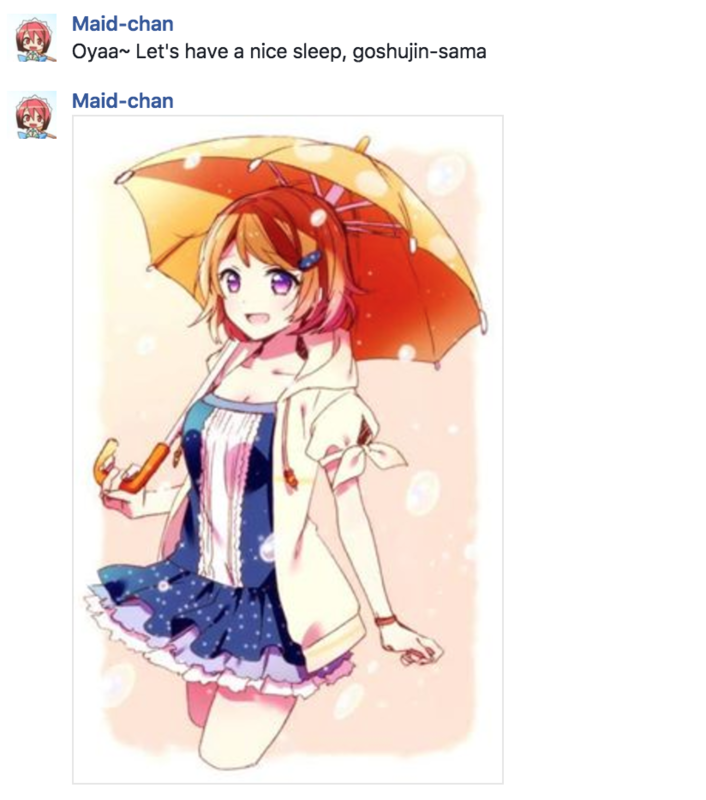 Instead of checking pages periodically, Maid-chan will send push notification via Messenger if there is a trouble with the monitored lines. Currently, Maid-chan only supports Asia/Tokyo timezone (UTC +9). All commands receive 2 parameters: redis_client as RedisDriver object and recipient_id as user’s identifier. help is used to get the list of all available commands from Maid-chan. subscribe offerings is used to subscribe daily offerings. unsubscribe offerings is used to unsubscribe daily offerings. update offerings is used to update information (wake up & sleeping time) for daily offerings. subscribe japanese is used to subscribe daily Japanese lesson. unsubscribe japanese is used to unsubscribe daily Japanese lesson. update japanese is used to update information (Kanji N1-N4 level) for daily Japanese lesson. update name is used to change user’s nickname. 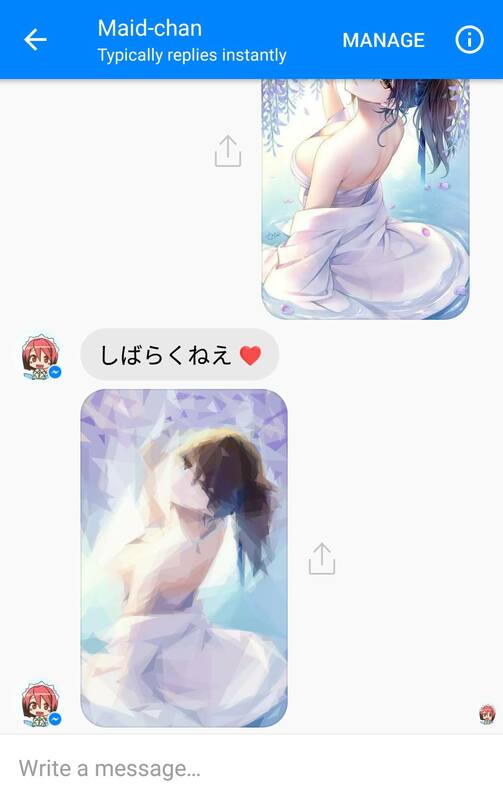 By default, Maid-chan will use onii-chan to call users. subscribe rss is used to subscribe a new RSS Feed with its pattern and let Maid-chan sends a notification if there is an update. unsubscribe rss is used to remove one of the registered RSS Feed. 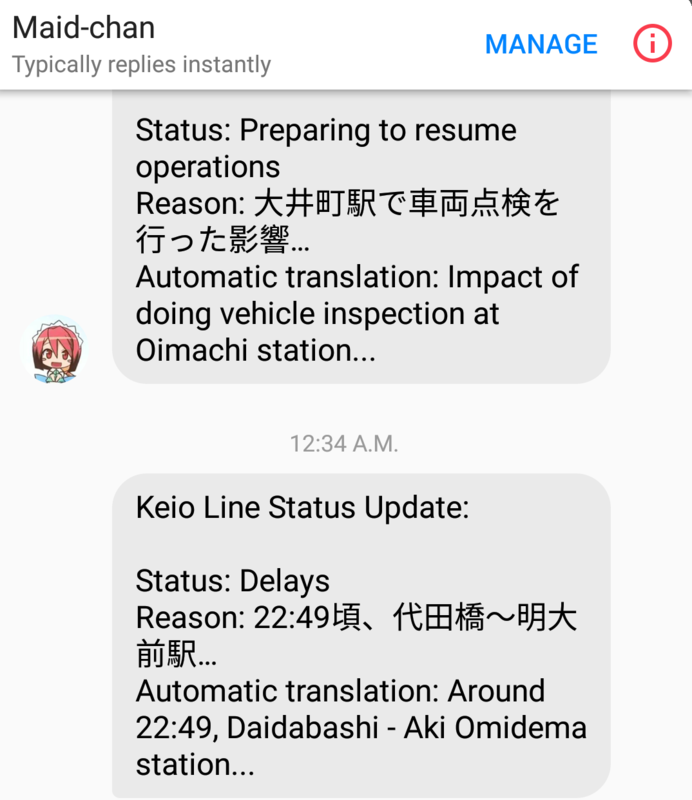 subscribe train is used to subscribe Tokyo train status notification and let Maid-chan sends a message if there is an update. unsubscribe train is used to unsubscribe Tokyo train status notification. show profile is used to show user’s nickname, subscription status, and preference.